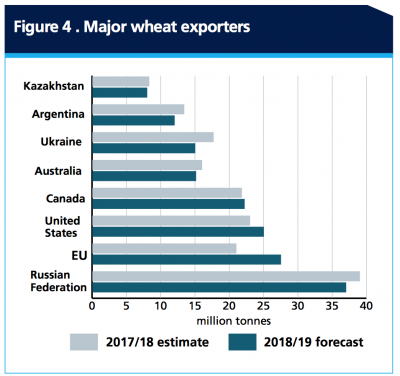 The Food and Agriculture Organization of the United Nations (FAO) recently published its biannual Food Outlook report that provides short-term forecasts for commodity production, trade and prices. Also this week, the U.S. Department of Agriculture updated its monthly trade database which provided more insight into agricultural trade prospects for this fiscal year. 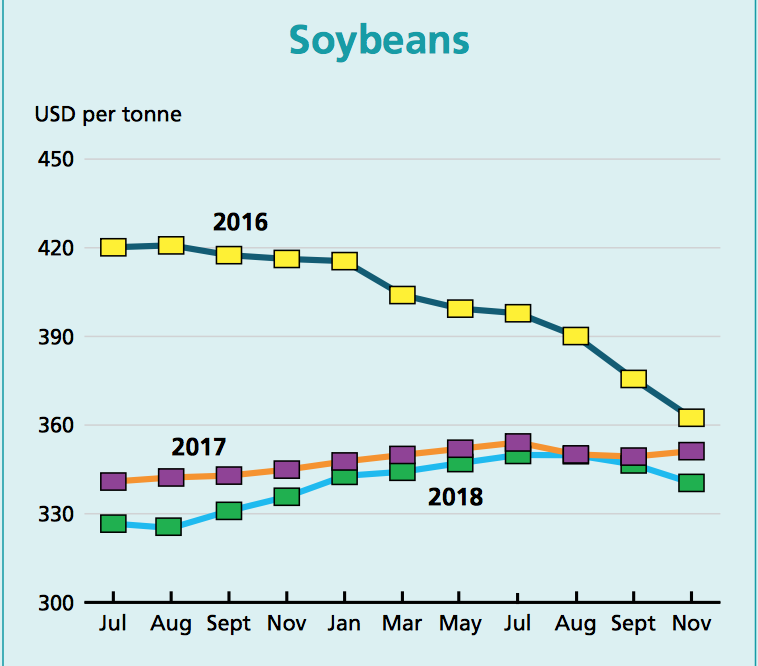 Meanwhile, recent news articles continue to focus on U.S. soybeans and the potential impacts of Chinese tariffs on exports. Today’s update looks briefly at each of these three items. 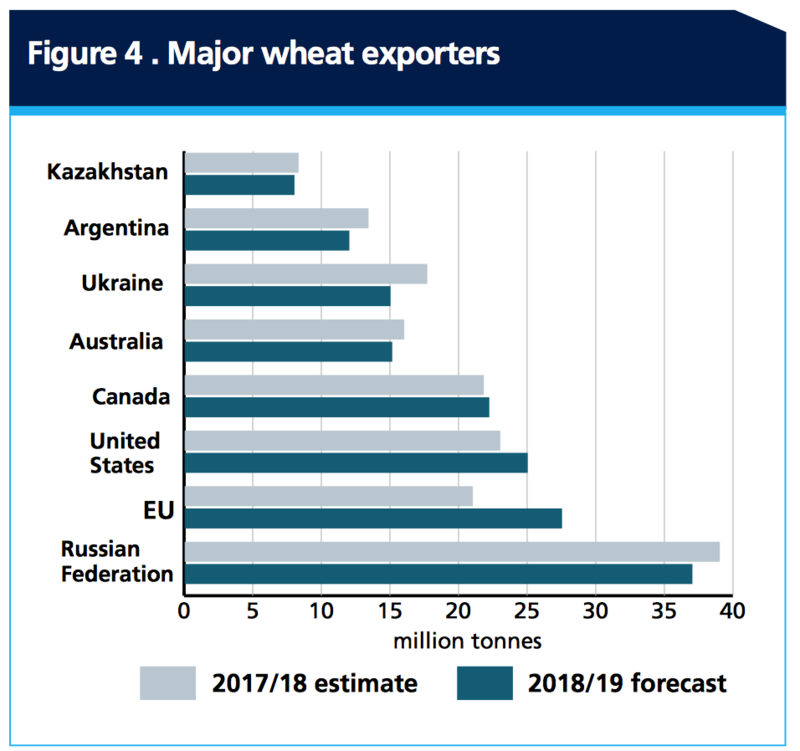 “Food Outlook- Biannual Report on Global Food Markets.” Food and Agriculture Organization of the United Nations (July 2018). While addressing coarse grain economic variables, the FAO report noted that, “In Latin America and the Caribbean, total maize imports are forecast at nearly 36 million tonnes, 1.3 million tonnes more than in 2017/18, with the biggest increase foreseen in Mexico, followed by Colombia and Chile. Maize imports by the region’s largest importer, Mexico, are set to reach a record 16.7 million tonnes, up 900 000 tonnes from 2017/18, driven by growing feed demand and this year’s decline in domestic production. 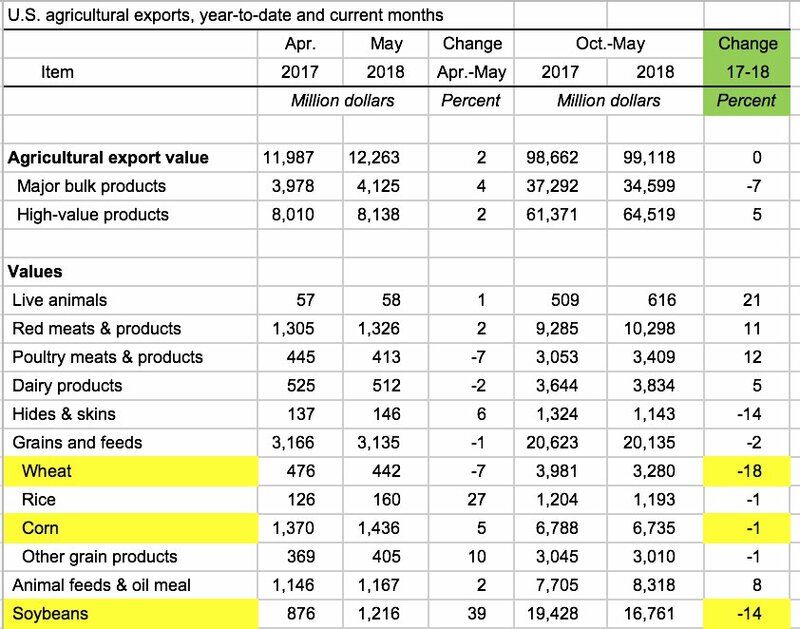 Recall that in June, USDA trade data showed that the total value of U.S. agricultural exports for this fiscal year (from October – April) was about two percent less than for the same seven month period in 2017. 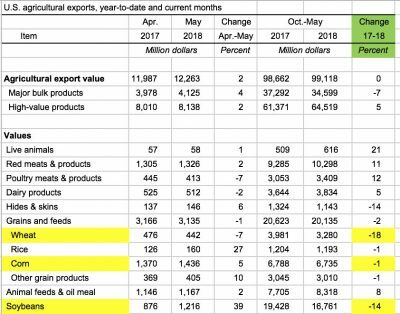 However, USDA agricultural economist Bryce Cooke explained in a recent USDA Radio update that the most recent trade data from May shows U.S. agricultural exports are now $500 million ahead of last fiscal year. Despite the overall robust May trade figures, export values for U.S. soybeans (down 14%), wheat (down 18%), and corn (down 1%) were all lower than a year before. Monday’s radio update reminded listeners that the May trade figures are “pre-tariff,” as is the current USDA export forecast, which projects total U.S. agricultural exports this year to exceed the 2017 level. Meanwhile, the Department of Agriculture will update its quarterly trade forecast at the end of next month. A separate USDA Radio update from Friday, which included remarks from World Outlook Board Chairman Seth Meyer, indicated that the World Agricultural Supply and Demand Estimates for July will include the Board’s “first shot” at considering the long-term impacts of the newly imposed Chinese and Mexican tariffs on U.S. agricultural products. 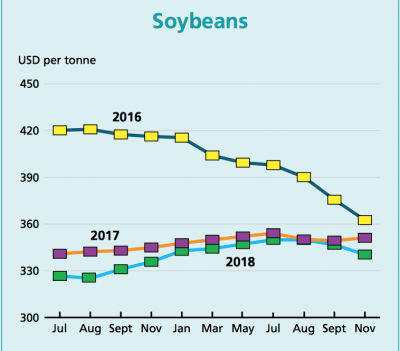 “The rush by US exporters to beat the imposition of retaliatory tariffs on soybeans by China will provide an artificial boost to second-quarter GDP growth, but will become a potentially significant drag in the third quarter. Nonetheless, Raymond Zhong reported on the front page of the Business section in Tuesday’s New York Times that, “For all its economic might, China hasn’t been able to solve a crucial problem. Soybeans. It just can’t grow enough of them. That could blunt the impact of one of the biggest weapons the country wields in a trade fight with the United States.